Delays, delays... maybe we should have seen this one coming, though. So it turns out that crank sensors for these cars are unobtanium. But one vendor has a solution. They managed to track down the OE supplier and now offer the guts of the sensor assembly. No bracket, no connector, just the core pellet with some wires sticking out. It’ll need to be spliced in. But before ordering that sensor, my brother made sure to yank the belts off of the engine and confirm that yes, of course we should definitely replace them. 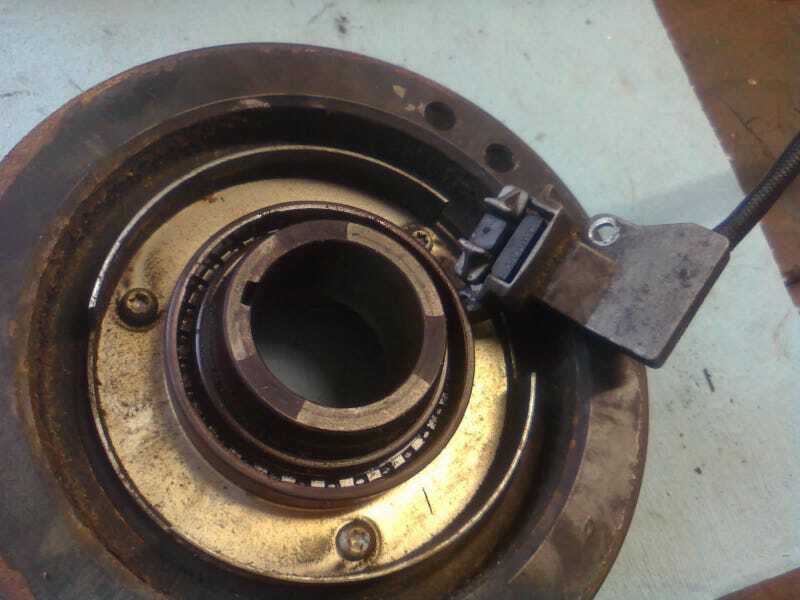 He also found an idler pulley that rotates rather... crunchily. Good catch! Well, here we are: the parts came in, and my brother managed to weasel the crank pulleys off. (Better his knuckles than mine haha. Saab’s placing of the “front” of the engine up against the firewall sure is a pain in the neck.) But that’s when we realized that maybe he should have ordered a harmonic balancer, too. The rubber insert is hardened and cracking, and we don’t want to have to take this back apart again any time soon to deal with it. So boom goes the parts cannon, again. Maybe we’ll have the engine running again next weekend? Maybe?